Straight (almost) alignment from P2/P1 down to P2/P3 and dorsal hoofwall. Hairline is "waved"; not a straight line down to the ground. This indicates a bit of excessive pressure in the quarter region. A slight rasping to arch the quarters would take care of that. 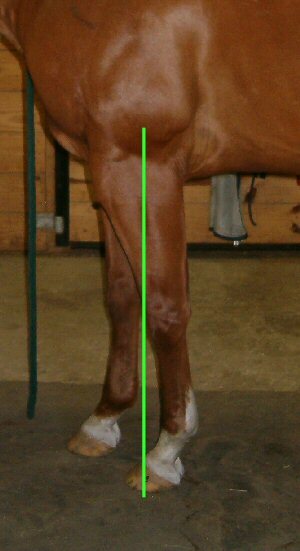 Dorsal hoofwall of this hoof is slightly more angled than the axis as evidenced from the green line compared to the red line. This photo shows perfect wall/P2 angle. Heel angle is also optimal being just a tad lower than dorsal toe wall angle. This shows a well balanced solar view of a front hoof. The issue I see with this hoof is the overly curved bars. Those will remediate as the hoof expands more and heals in a normal hoof. This hoof is a club but depicts good balance. The heel noted at top of photo is slightly shorter in length than the heel at the bottom and should be brought back just a tad. This photo shows a nicely balanced hoof with good sole callous (blue) and equally formed and sized heel bulbs. Good 1/3rd:2/3rd ratio of hoof form. 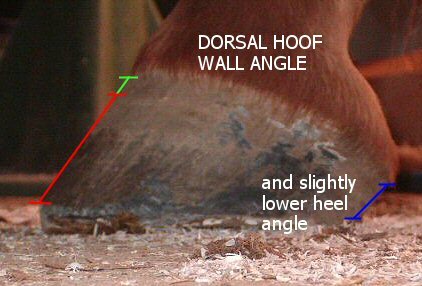 The dorsal wall (front wall - red line) angle should be the same as the periople angle (green line) and the heels should have a slightly lower angle than the dorsal toe wall. Again, this hairline is waved and indicating pressure from somewhere in the quarter region. Photo hard to see but this hoof is almost is about as perfect to being solarly balanced as any I've seen. Frogs are passive (when standing on ground the frog will just barely touch the ground. When loading, frog will have full, active pressure contact with the ground.) Walls are of even height; heels even and leveled; collateral grooves even and indicating good balance of the CB. 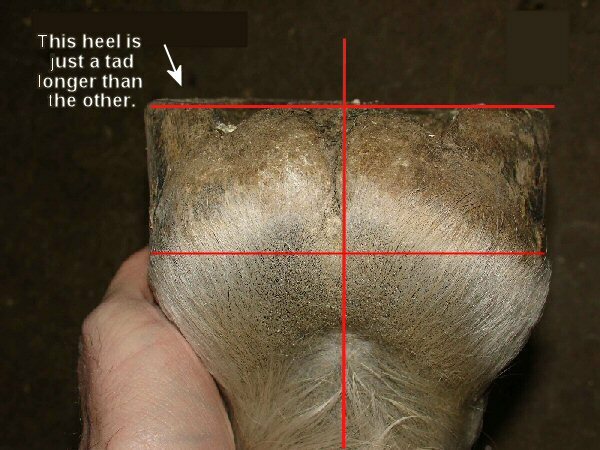 Look at the central vertical line and the horizontal ones: horizontal across from start of hoof growth at the hairline on each side of the hoof and then one right across the level plane of the heels. You can see the smidgen of heel and wall that is higher on the left side of the photo. You can also see that the bulbs of the heel are not equal. 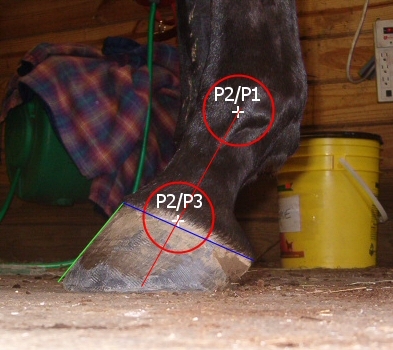 A perfectly balanced hoof will be within the guidelines as drawn with no excess above the lines and the line at the new growth will be at right angles to the vertical and horizontally level. This hoof is almost perfectly balanced. These three photos to show horizontal levelness. 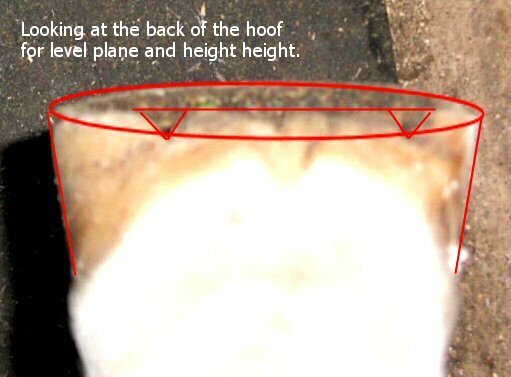 From the front of the hoof ... hairline is horizontal to level ground and the hoof sits squarely at the end of the limb. Solar view shows almost perfect balance with even heels and if the hoof were to be folded in half the two halves would superimpose one another. 1. Standing in back of the verticle indicating heel issues. 2. Standing in front of the verticle indicating toe issues. How are your horse's hooves matching up?